Coming from Japan, bought when she was 18 years old, was one of the first three ferries of the company founded by Gerasimos Agoudimos in 1991, together with her sister "Milena" and the "Dimitra". Was extensively refitted to give her a "Cruise-Ferry" appearance; the only things that I can notice from the photos I have is the replacement of the funnels, after her entrance in the fleet. In her first years under G.A. Ferries livery was usually deployed on the long run between Piraeus and Rhodes via Paros, Naxos, Ios (less frequently), Santorini, Heraklion, Kassos, Karpathos and Chalki; later was also on routes to Ikaria and Samos, then, for a period, she ran along with "El Greco" between Thessaloniki and Heraklion stopping at almost all the islands on her way. In 2002 season is again on Ikaria – Samos line, linking also once a week the Dodecanese islands of Patmos, Leros and Lipsoi. On 2003 she remains mainly employed on Samos line, serving also Chios and being diverted once a week to Western Cyclades line; on 2004 summer instead, was totally on Ikaria – Samos line, calling once a week also in Kavala, Limnos, Lesvos and Chios. Her Greek career came to an end in 2005, and in the summer she'll sail together with her sister on the new international service Brindisi – Cephalonia – Zakynthos – Patras. Flagship of G.A. Ferries, was bought in 1989 from Higashi Nippon Ferry of Japan, which operated her as "Virgo" on connections between Hokkaido and Honshu. She spent all 1990 year on refit at Perama, where she was fitted with restaurant, self service, disco and swimming pool, entering in service on summer 1991. With this ferry the concept of "cruise ferry" was expanded also to the Rhodes Line, where Rodanthi was deployed, serving also Paros, Ios, Santorini, Heraklion and Karpathos. After two successful years of services, the board of G.A. 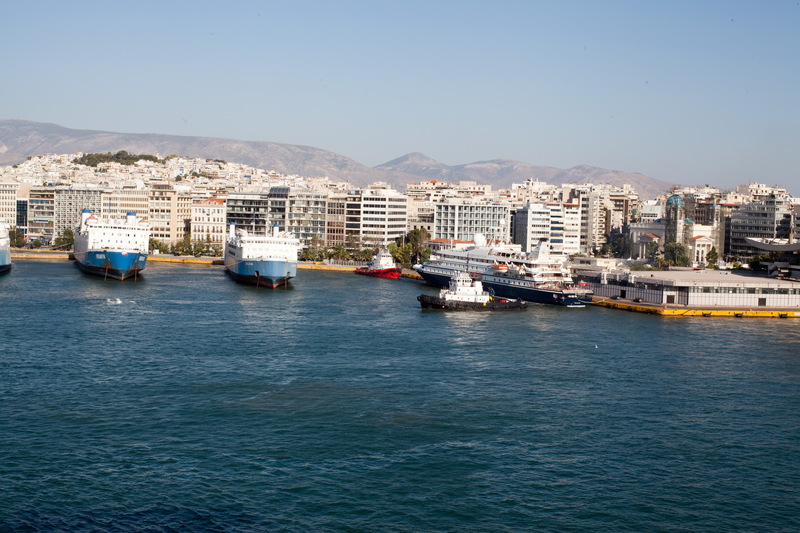 Ferries decided to explore the Italy – Greece market, linking Ancona with Corfu, Igoumenitsa and Patras, competing with the veterans of this international service, Anek Lines, Strintzis Lines, Minoan Lines, Marlines and Karageorgis. The planned timetable is two sailings per-week from Ancona to Patras via Corfu and Igoumenitsa on low season, but on high season the timetable featured a very-improbable three sailings per week to Corfu and Igoumenitsa, arriving at Patras on Saturday departure. This second timetable in fact was never performed; moreover, the high competition forced G.A. Ferries to close the Adriatic line after only one year, redeploying back to Aegean the "Rodanthi" which left this sea only on summer 1995, when she was chartered to COTUNAV. After the international experiences of mid 90's, the "Rodanthi" was always on Rhodes line, but not via Crete: she linked Piraeus with other Dodecanese islands (Patmos, Leros, Kalymnos, Kos, Nissiros, Tilos, Symi), approaching often also at Paros, Naxos, Syros and Astypalea and, from 2002, arriving also at Kastelorizo. On summer 1996 the ship left Rhodes line being deployed on a daily basis to Paros, Naxos and Santorini serving twice a-week also Syros, leaving from Piraeus at 20.00, arriving at Santorini the next day at 05.00, departing back at 07.30, docking at 16.00 in Piraeus. On that year I had the pleasure to sail aboard "Rodanthi", on 25/06 from Piraeus to Santorini and, two days after, from Santorini to Paros: on my opinion she is one of the best ferries sailing in Greece, but a recent enquiry of ADAC, the German Automobile Club, indicates her as one of the worst ferries in the Mediterranean concerning safety on board, classified as 33rd on 34 ferries inspected (34th was the Tirrenia's "Flaminia"). Surely ADAC's observations are right, and probably the new entries in GA Ferries's fleet are far better about safety, but no one of recent acquisitions is converted as a beautiful cruise-ferry as Greeks did between the end of 80's and the beginning of 90's. On 2005 she still sails to Rhodes, calling only at the main islands on the route, performing three round-trips per week and remaining at Piraeus on Saturday. Is the ship getting too old or is the company which wants to save money on fuel?